Microencapsulation Market size will likely surpass USD 14 billion by 2024; according to a new research report by Global Market Insights, Inc. Growing awareness and demand for fortified food products added with increasing demand from the pharmaceutical industry for various applications, and emergence of new technologies are the key factors fueling the microencapsulation market. Moreover, enhanced and uplifted product properties helped to drive the microencapsulation industry share. Expansion in pharma sector coupled with extensive research & developments in the healthcare field are driving the microencapsulated drugs market. The demand for microencapsulated drugs and probiotics is projected to witness an upward trend during the forecast period. Widespread applications in several end-use sectors to enhance core product functionality is increasing the demand for microencapsulation. The market players are responding to these new opportunities by expanding their geographic presence and services. Increasing acceptance of specialty detergents & cleaning agents due to rising disposable income and changing consumer preferences in developed as well as developing countries will further boost the microencapsulation industry demand in future. The specialty detergents with fragrance microencapsulation leave a lingering scent on laundered clothes for above 2 weeks. FMCG companies including Unilever and P&G use microencapsulation technology in fragrances, bleach activators, and anti-bacterial compounds due to its ability to improve core product specification, positively influencing the microencapsulation market size in the projected timeframe. Microencapsulation market has been segregated in accord to core materials, coating materials, technology and application. Liquid core material held the major portion of the market due to its easy dispersion and dissolving characteristics. The material is widely used in pharmaceutical, cosmetics and food industry. Based on coating material, ethyl cellulose microencapsulation market is likely to grow at a significant CAGR in forecast spell. These materials are water insoluble resins and broadly used in pharma industry in the form of viscosity increasing agent, flavoring fixative, coating agent, filler and also employed as an emulsifier in food additive industry. Chemical technology is expected to grow at a considerable rate during the forecast period owing to its avid application in pharma and cosmetics businesses. This technology comprises polycondensation, interfacial cross linking, etc. Interfacial cross-linking method is basically designed to minimize the usage of toxic diamine in the final applications. The applications include food additives, agrochemicals, pharmaceuticals and house hold products. Demand for the technology in the food & beverage industry is estimated to progress at a CAGR close to 10%. Improved nutritional value of food products provided by the technique along with taste, color, texture, and aroma is the primary factor driving its demand in the sector. 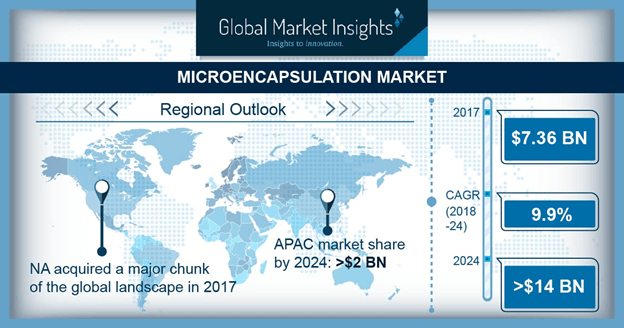 Asia Pacific microencapsulation market will account for more than USD 2 billion in 2024. This can be ascribed to rising awareness regarding health & well-being among individuals coupled with increasing purchasing power and changing retail and dietary preferences. The major companies in the microencapsulation market include 3M, Dow, Syngenta, Encapsys, BASF and Bayer.